The Boko Haram (loosely translated as western education is a sin) is a terrorist sect of Islamic fundamentalists based in northern Nigeria. The group’s central belief is that Nigeria has been soiled by Western beliefs and constructs. They have made it their mission to eradicate western culture by terrorizing the nation through attacks on military checkpoints, police stations, highways, schools, churches, mosques, the UN building, bus stations and most recently kidnapping over 300 girls from Chibok boarding school in northern Nigeria. The price of their mission? Over 5,000 slaughtered Nigerians. The tale of Nigeria is a tale of sectionalism itself. Under the colonial rule of Great Britain, Nigeria was exploited for its vast array of natural resources. Britain particularly focused on Nigeria’s coastal resources, which are found in the South. This fostered great poverty (so bad that people steal sand from ancient walls) and resentment in the north. This divide is fertile ground for hate and revolution. The Boko Haram, originally named Jama’atu Ahlis Sunna Lidda’awati wal-Jihad, or “People Committed to the Propagation of the Prophet’s Teachings and Jihad,” was founded in 2002 by a Muslim cleric named Mohammed Yusuf. Their inception came after a transition period in which the country moved from a dictatorship to a democracy. Many Northerners were suspicious of the change; democracy was seen as a western construct and many were afraid that this would be used as a tool of disenfranchisement. The Boko Haram have gained traction because of the ‘democratic’ government’s reputation for corruption, and many join the Boko Haram because they are convinced that the federal government is more concerned with enriching themselves than with enriching the people. The Boko Haram is the love child of hate and suspicion; this makes them a very dedicated and very dangerous enemy. The abduction of 300 at Chibok is not their first attack on schools. In fact in 2013, over 50 schools were attacked and over 100 school children were murdered. Thousands of students and faculty members in schools in northern Nigerians have fled in fear of the Boko Haram. By gripping the Nigerian psyche with fear, the Boko Haram is slowly achieving their goal. They are breaking down constructs of the west, including education. This is not the first kidnapping of school girls. Two weeks before the Chibok abduction, 25 young girls were kidnapped from Kondunga, a town in northern Nigeria. When stolen, these women are converted to Islamic faith and either sold into slavery or forced into marriage, which are essentially synonyms in these situations. President Goodluck Jonathan has declared war on the Boko Haram, but with little success. The Boko Haram is killing faster, and more efficiently than ever before with over 1,500 lives taken in the first few months of 2014. This increase sprouts from the fact that the Nigerian military has not yet partnered with bordering nations to stop the terrorists. This allows the Boko Haram to destroy within Nigeria, and then flee to other nations to plot future attacks. Also, in typical Nigerian fashion, the $6 Billion being spent on the military each year is not tracked and is likely ending up in the pockets of prominent politicians and businessmen. The most disturbing thing about the government’s reaction to The Boko Haram is their apparent apathy. It took President Goodluck three weeks to address the matter of the missing girls, and instead of a rousing speech calling the people to arms and giving the people a reason to believe in their government, he simply stated that he did not know where the girls were. This apathy has leaked down to the military, who allegedly don’t use the information given to them by the victim’s mothers and have now resorted to indiscriminately killing northern Nigerian men. What has apathy brought the country? 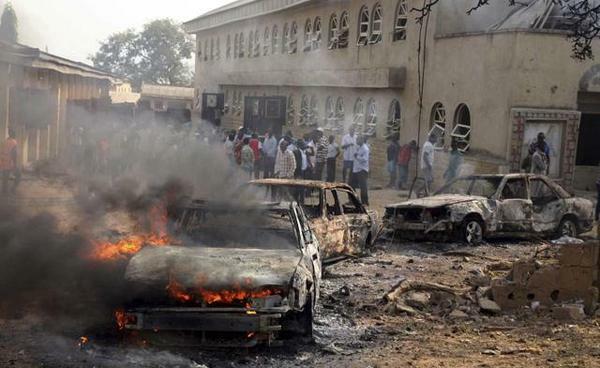 More killing, as 300 people were massacred in another attack on a northern Nigerian town on May 8, 2014. At this rate, the burning of Chibok may foreshadow the fate of the entire country.